Because of the Preakness Stakes, I was thinking today about Leonard Pennario and how he loved horse racing. 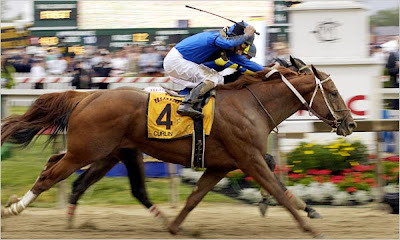 If Pennario were alive I am sure he would be watching the Preakness. He watched it last year. But what about this crowd of slugs and schufts at the Preakness? I just found this on the Baltimore Sun's site. Imagine wanting to be a part of this! Pennario would be aghast at this scene. That is for sure. It is almost as bad as George Bellows' "I Remembering Being Initiated Into the Frat." Remember that? But Pennario did love horse racing albeit in a very genteel style I would never be able to glimpse on my own. Pennario would go to California horse races and often he would be asked to crown the winner. My brother George has a very funny story about how when the great pianist came to Buffalo and we all ended up at the Hyatt, there was a conversation about horse racing going on. Pennario was at another table in a whole different conversation but George said you could tell he was tuned into the horse racing conversation that was going on without him. This is the funniest part of the story: Someone raised some question about some jockey or other, and you could see Pennario nodding, trying to answer the question while continuing to converse with whoever it was who was monopolizing him at the time. Which was probably me. Ha, ha! I am web-logging about the Preakness because that is one of the topics everyone is searching for today. I want people to be searching for Preakness and find themselves on the Leonard Pennario Web log. You have to learn to use trends like this to your advantage! For instance everyone is searching for "Wolfram Alpha." I have absolutely no idea what that is. But I am going to go with it anyway. Say the name Wolfram to me and I think of Wolfram von Eschenbach. He is the troubadour from "Tannhauser." Pennario and I went to see that opera together! I heard Wolfram sing the "Evening Star" aria while I was sitting next to the Alpha Pianist. That is something I will never forget! See, we are on top of the trends here at the Leonard Pennario desk. Welcome, new fans and followers! That is really cool to hear about Pennario in that conversation, lol! That is great! That is talent! Other than that, I seem to be off track today. That crowd reminds me of 1969 when I was up your way to the Woodstock festival. The main difference is the hair length. And why do I think of Wolfman Jack? I forgot all about the Preakness until I saw your comment on Facebook at about 6:18, ran to the television, and caught most of it without the less than interesting buildup. Great race! Becky, did you bet? Larry, you were at Woodstock??!? I would never have guessed that! Well, between you and me, I bet there are a lot more things that you would never have guessed! But, I am all grown up now!